A gorgeous rare phenomenon colored the clouds of Costa Rica's sky into a rainbow hue earlier this week, prompting heated online debate between atheists and creationists as to the cause of the stunning sight. 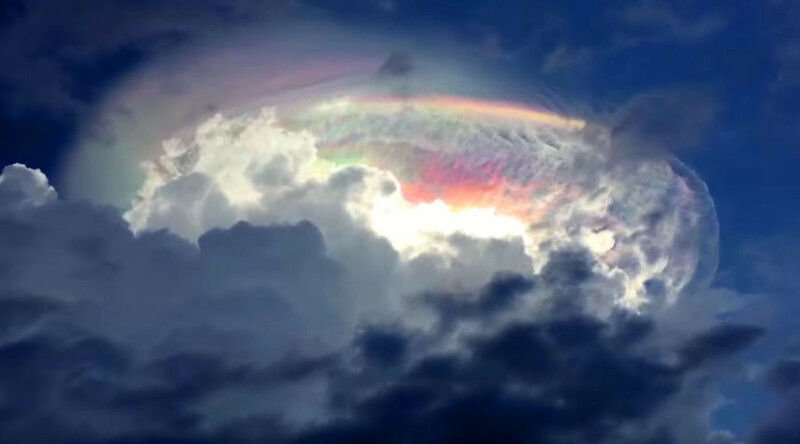 A cartoon-like rainbow cloud appeared, and if it weren’t for YouTube videos that onlookers posted, one would think it was PhotoShopped, as the beauty of the phenomenon appears unrealistic. Scientists call the effect ‘cloud iridescence’ and it’s caused by diffraction when small water or ice particles individually scatter light. One YouTube user described the phenomenon as if it resembled the end of days. This point of view immediately sparked a heated debate over religion and creationism in the comments section. Commenters quickly forgot about the cloud and began arguing over the existence of God. “I have faith that it's sunlight refracted through ice crystals in the upper atmosphere... because that's what it is. No invisible Sky Daddy required,” reads a comment from YouTube user exham. Cloud iridescence is rare enough to surprise many people all over the world when they first see it with their own eyes, as social media demonstrates. It was a lucky coincidence that such a bright and large iridescent cloud appeared in the Costa Rican skies on the country’s Independence Day.